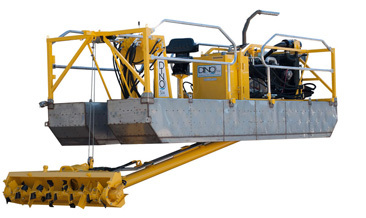 Introducing The Dino8 Dredge | GeoForm International, Inc. The Dino8 dredge is doubling the performance of our already powerful Dino6 dredge. Born of our success in the world of small powerful dredges, comes the demand for something for those larger jobs. The Dino8 is doubling the performance of our already powerful Dino6 dredge. Designed with simple serviceable systems and components, along with proven Cummins diesel reliability and performance, the Dino8 can cut your time on the job in half. We are delivering to you, a system with 3000 gallon per minute capability, the ability to pump much further distances and the simple operation our customers have come to love. The phenomenal pumping capabilities of the 8″ Geoform hydraulic submersible slurry pump coupled with our commitment to simplicity, efficacy, and durability has created another powerhouse of a machine in a compact package. 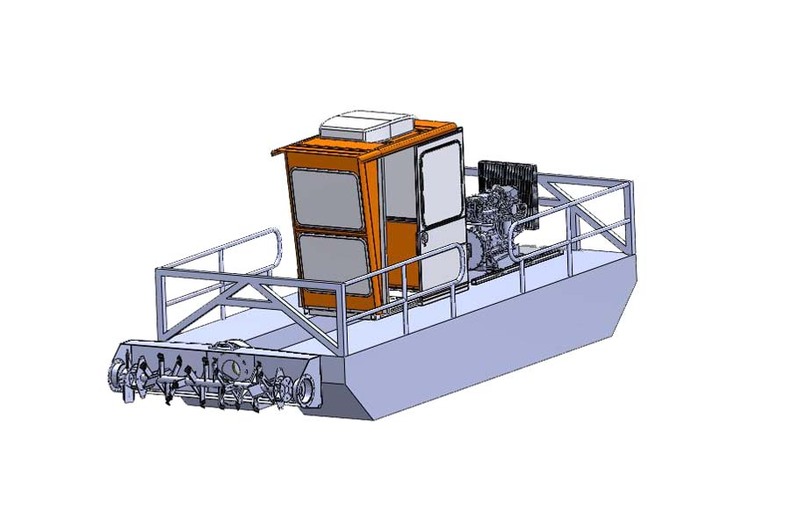 The Dino8 is your solution for mid-sized dredging projects. The Dino8 dredge is a sediment removal system designed with the small footprint we are known for, and the incredible pumping capacity we always deliver. It all starts with a set of compartmentalized stainless steel floats, that we manufacture in house and pressure check prior to utilizing. We have chosen a cummins turbo diesel to power the Dino8, for performance, reliability, and global support. The power plant turns hydraulic pumps to deliver horsepower to all of the hydraulic circuits as needed. Those circuits include the cutterhead, pump, windlass, and winches. It’s that simple, right? Our cutterheads are manufactured with readily serviceable wear parts. 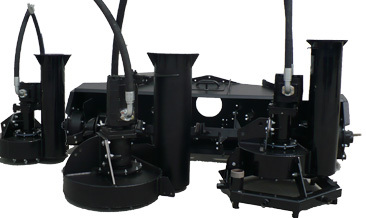 The cutterhead shroud includes porting for water-jetting. The pump is one of our own 8″ submersible hydraulic units designed to work efficiently in a wide variety of materials including sand and cobble. The unit travels back and forth along a 3/8″ cable drive system (windlass pulley drive) allowing an enormous amount of energy to be brought to bear on the work surface and also countering the effect of current, wind, and pipeline pulls. Steady, trackable progress across the job, moving cubic yards per minute. How many yards can this move? A: Baseline at 2CY of insitu material per minute. How does this differ from the Dino6? A: The Dino8 has twice the capacity for volume “or” pumping distance of the Dino6. What is the draft of the Dino8? A: 18″ for operational needs. Is there an option for non-cable operation? A: Not at this time. We are firm believers in the fact that the exceptional levels of production that we achieve are directly related to the amount of pressure we can exert into the workface by way of our he cable rigging. What are the options for launching the unit? A: The machine can be floated directly off our trailer, or hoisted. How do I move this around on the water? A: a small John boat or tender is enough to position our Dino8 on the job site.